/Instagram Captions will Make You Tons of Cash. Here’s How! Have you noticed that your posts aren’t being read, no likes comments or follows – learn how Instagram Captions will make you tons of Cash. Instagram is everything about visuals. Whether you decide to post photos or videos, you know that this is the best way to gain Instagram followers. However, even though the visuals’ quality is amazing, there is still a piece you need to complete the puzzle. Instagram captions will help you speak your voice and show your followers your brand’s personality. But, what should an engaging Instagram caption look like? Or, is it better to include the maximum number of hashtags in it? You will find the answer to all these and much more in this article. However, the bottom rule is clear. A creative and engaging Instagram caption should reveal to your Instagram followers the story of your photo and invite them to take action. Keep reading this article and discover how Instagram Captions will make you tons of Cash. A good Instagram caption can help you in many ways. For instance, it will help you express your personality and make your brand stand out of the crowd. In fact, it will become easier to make your followers react to your post by giving you the possibility to include a call-to-action in the photo description. 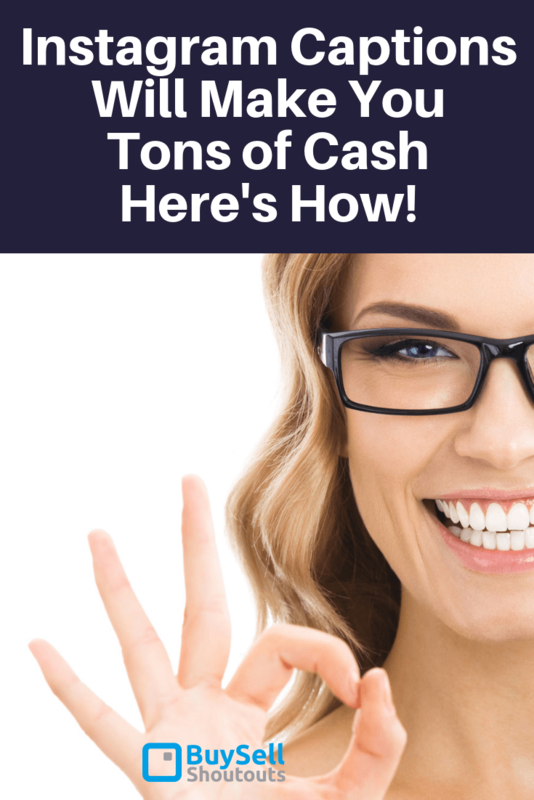 Let’s not forget that most of us are trying to monetize our Instagram – great Instagram captions will make you tons of cash! Finally, by including hashtags in your Instagram caption, you will increase your visibility and gain new Instagram followers. Therefore, writing an Instagram caption should be on top of your priorities. SEM Rush – it will help you find the most appropriate keywords for your Instagram captions to increase your brand’s visibility. They help them discover the human side of each brand and establish connections with it. Therefore, when you post a picture on your Instagram account make sure that you also give insights on where and how that photo is connected to your brand. By including stories in your Instagram captions, you add a human touch to your brand, bringing followers close to it. Take the example of Canva. They ran a campaign on Instagram where they published photos of their customers together with stories about them. This is how Canva’s other followers learned more about who the brand’s customers are, their business, and how they use Canva. Remember that people usually check their Instagram feeds at an extremely fast pace. People can’t dedicate much time to spend on social media unless there is something that really gets their attention. Therefore, if you want your Instagram captions to be engaging, then they shouldn’t be too long. For instance, if your photo speaks for itself, then it should be better not to add too much content as it will become redundant. You should keep in mind that when your post appears in feed, Instagram will only display the first three lines. Therefore, if you create an extended caption, then your followers will have to tap on “More” to see the rest of your caption. If you want to make your followers curious about your post, then you should include the essential information in the first three rows of your Instagram caption. Creating a good call-to-action and including it in your Instagram caption, is an excellent way to attract followers and make them engage with your business inside and outside of social media. You can ask your followers to click on a link or tag a friend who would be interested in your products. I don’t recommend to exaggerate with this strategy. Make a selection of your most important posts and include call-to-action points in them”, says Neightan White, an editor at Supreme Dissertations. You can easily make your followers take action by including words like “start”, “join”, “stop”, or “discover” in your Instagram captions. Last minute gift ideas keep popping up… Check out our “❤️ Holidays” Instagram Highlight for a #StarbucksCard pop-up DIY. When writing Instagram Captions will make you tons of Cash, your focus will be around showing your brand’s personality. Therefore, it doesn’t matter how technical your products are; people will always react well to a content which includes a bit of humor. People are already tired of boring and spammy content. They are looking for something interesting to read, which will also put a smile on their face. You have the perfect strategy to stand out of the crowd and catch your followers’ attention. However, you shouldn’t turn yourself into a comedian on Instagram. It is enough to post from time to time some cute photos together with an easy-to-consume caption, and you can be sure that your followers will have a positive reaction to your posts. What is an Instagram caption without hashtags? It is like a steak without salt and pepper. Hashtags are precisely what you need when you want to increase your brand’s visibility. However, even though many marketers would think that if they fill their posts with hashtags will automatically bring more followers, the reality is quite different. It is true that including many hashtags will attract various followers who have different points of interests. On the other hand, creating Instagram captions suffocated by hashtags will seem spammy for your existing followers. Therefore, it is important to find a balance in the number of hashtags you will include in your Instagram caption. Before you insert them, you should first think on what’s your audience’s biggest interest and thus cover those that are most relevant for them. The ways to create interesting Instagram captions are infinite. However, before jumping into selecting one method or the other, you should first know very well what your audience expects from you. Based on your research you will immediately understand how serious or funny your tone can be. What is more, based on your audience interests, it will become less complicated for you to select the appropriate hashtags to attract more followers. You should always double check your Instagram captions before posting them. Use relevant tools to correct any grammar and spelling mistakes or collaborate with professional writers who can deliver flawless texts. Bridgette Hernandez is a Master in Anthropology who is interested in writing. She is planning to publish her book in the near future. She finished school last year but is already a true expert when it comes to presenting articles with creativity. Since she started collaborating with RewardedEssay and GrabMyEssay, she has been noted for writing as always informative, based on qualitative research and pleasant to read.